Molly Ross was nervous. It was the spring of 2017, a few days before the SIRA Championships in Tennessee, where her boat would finish first in the 2v8+ finals for K-State's rowing team. To be clear, Ross was not nervous about the race. Or, at the very least, if she was, it was not the only thing she was worried about. Back on K-State's campus, her senior design project for mechanical engineering was being tested. The project? To take an SLR camera and turn it into an X-ray imaging camera — essentially a handheld CT Scan machine. While waiting for the results in the lobby of K-State's hotel before a practice, Ross ripped off multiple text messages to her two project partners. "Does it work? Does it work?" Every second without a response added to her suspense. She began repeating, "Is it going to work?" in her head. Eventually, she got confirmation. The camera, which took months of long weeks and sleepless nights, worked. "They sent me the first round of pictures that we got off of it, so it was really cool to see," she said. "It was really exciting. I was pretty sure it was going to work, but there's always that chance that something doesn't go right." That moment represents a snapshot of Ross' life, one where she's constantly balancing the demands of rowing and engineering, and always invested in succeeding in both. More times than not, she does. "She just basically is a go-getter," Hitesh Bindra, associate professor at K-State in mechanical and nuclear engineering, said of Ross. "Whatever she wants, she will get it." Bindra was Ross' senior design project supervisor. He was so impressed by it and the way Ross led her team that he suggested she pursue graduate school and, if she was interested, her Ph.D. at the same time. She said yes and created a new meaning for the word student-athlete. After graduating in December 2017 with a bachelor's degree in mechanical engineering and a minor in math, Ross jumped right into graduate school for a dual pursuit of a master's degree and Ph.D. in nuclear engineering. She also continued to row — the reason she came to K-State in the first place. She said the two, her sport and her studies, are connected in many ways, some of which are easier to explain than others. Together, they make her days long and lack much free time. But, she said, they are both worth it. "It's doing things that I love," she said. "It's really easy to go all the time when it's something that you love." Some pieces of Ross are easy to understand. Others, not so much. For example, Ross is a dog person obsessed with cat T-shirts. On one random trip to Wal-Mart, friend and teammate Selena Wapelhorst said Ross tried on all of the store's cat T-shirts… at once. "She put all 34 of them on," laughed Wapelhorst. "There are duffel bags full of cat shirts," K-State junior Madison Rebel added, also laughing. "I just don't understand." What's easier to figure out about Ross is where she got her engineering-driven mind. Her father, Mike, is a civil engineer. Her two older brothers, Cameron and Adam, both earned engineering degrees from K-State as well. "I think her family has a huge impact on the kind of person that she is," Wapelhorst said. Ross said she chose mechanical engineering because she was intrigued by moving objects — cars, for instance. She knows a lot about them. More than once, Wapelhorst said she's been around Ross as someone tried to explain something car-related to her, not knowing her background. "She'll just sit there and let them explain, and then she'll be, like, 'Actually these are the flaws in the design. This is what they should have done, and this is why this other car is better in performance,' and just blow them out of the water," Wapelhorst said. "That's Molly." Rowing fits right into the way Ross is wired as well. Explained in its simplest form, it's about power and efficiency. "In a boat, obviously, there are a lot of engineering principals just in the motion of the boat but then also everybody working together. Mathematically and physically, it adds up," she said. "I like rowing over some other sports just because the more effort you put in, you see obvious improvements in your times. It's very much an effort-based sport. It's, 'Can you pull your weight or not?'" In some less-explainable ways, Ross said rowing has helped her in engineering. One example she pointed out was when she was trying to write a code that would "basically turn 2D X-rays into 3D X-rays." She spent more than 40 hours on it, unsuccessfully. "I was getting so frustrated," Ross recalled of the day she figured out the code during an indoor practice. "I was in the tank and I wasn't even trying to think about it in the tank, but it just clicked. I went back and had it done within 10 minutes. "A lot of people ask me, 'Aren't you exhausted mentally and exhausted physically?' but sometimes pushing myself to be exhausted physically has actually helped my mental thought process." Ross also said that without the support she receives on campus and from her rowing family, she would not be able to get through her days. These can start as early as 6 a.m., for practice and typically end well after 10 p.m., with little to no down time in between. Bindra, she said, has been "really supportive" of her rowing and flexible when its schedule conflicts with school. Her teammates have helped in about every way they can. Sometimes that means bringing her a meal when she cannot get out of the office. Other times it's filling up her car with gas to save her a few minutes after work. "The community that rowing has, in general, is something that makes our sport really unique. There's no MVP, there's no specific person that stands out. It's a boat, it's collective, it's a unit," Rebel said. 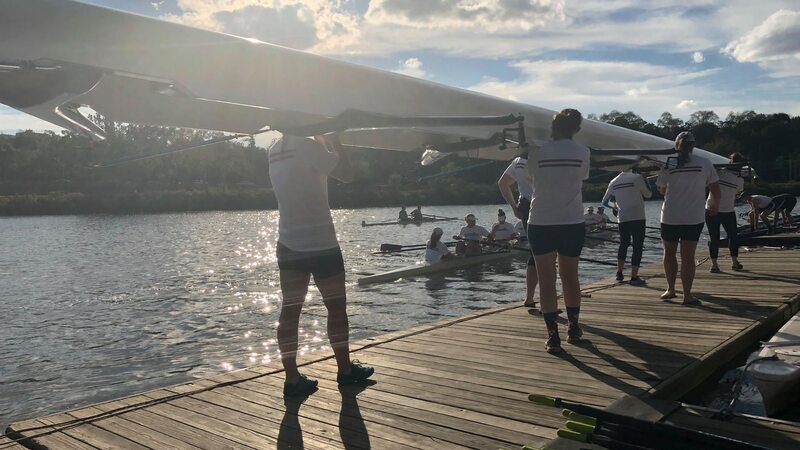 "Something we work hard on doing is not just letting that unit be on the water but making sure that unit also includes supporting and encouraging those within academics, within our social life. I think the fact that we're all in a boat, you work harder because of your teammates. "We see how hard she works, so it's easy to be that person for her because we know all the effort that she's putting in, and we know she'd do the same thing back for us. You can't say no to Molly." MORE: What exactly is the role of the coxswain? Ross has never been out of North America. In December, that will change. She will travel with more than a handful of other people from K-State's College of Engineering to Mumbai, India, to present her current research on, "Neutron imaging of percolating hydraulic flow through a simulated debris bed." It will follow a November trip to Orlando, Florida, for the same purpose. Bindra said the research Ross submitted to these conferences — a "competition, practically," he added — was placed in the "first group." "That's very good," he said. It's not a surprise, however, considering how quickly she transitioned from mechanical to nuclear engineering. Take the neutron camera the college recently ordered, for example. It included software coded in German. Yet Ross, who doesn't speak German, "somehow figured it out," Bindra said. "That's very impressive," he added. "She's very quick to learn things and be a performer. I don't know if that's her innate ability or just based upon her involvement with athletics, but she has this conditioning that in a short time frame she's going to perform and succeed, that winning type of mentality." This past summer, she took over more responsibility for Bindra, serving as a lab manager and overseeing more than 10 students in the engineering school. Her ability to handle the extra work followed a pattern Bindra noticed when she was a senior in mechanical engineering, helping turn a camera into an X-ray machine. "She's a leader," he said. "She's not afraid. She has courage, she's creative and she has desire to do things, build things." Her teammates have noticed the same qualities about her in the boat. She tends to make those around her better, to build them up. "She's always coming in here with a positive attitude, always coming in here pushing you and keeping you accountable," Rebel said, as K-State opened its 2018-19 schedule this past Sunday at the Jayhawk Jamboree in Lawrence. "If your numbers or your splits are lower and she knows that you have more potential than that, she's not afraid to get on you, be honest with you, and encourage you to work harder, which, obviously in a sport like this, you need someone like that and you need someone to keep you accountable. She's that person for a lot of us. She's the person that I go to when I have a bad practice or even a bad day in general. When I open up my phone, the first person I want to talk to is her."